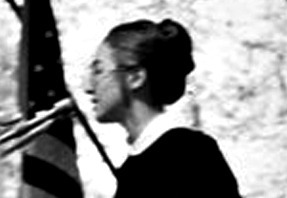 Long before she became a Clinton, Hillary Rodham had an early and activist career as a speaker--so much so that Wellesley College broke with tradition and gave her a place on the commencement podium as its first student commencement speaker. On that day in 1969, she followed the main speaker, Republican Senator Edward Brooke, and right at the start, signaled that she would rebut his remarks with all the impatience of her generation in a tumultuous time. Do her words sound like those of today's agitated electorate? We've had lots of empathy; we've had lots of sympathy, but we feel that for too long our leaders have viewed politics as the art of the possible. And the challenge now is to practice politics as the art of making what appears to be impossible possible. After she contributed what she referred to at the start as "that indispensable element of criticizing and constructive protest," Rodham turned to her central theme, which focused on three qualities: Integrity, trust, and respect. Those three words mean different things to all of us. Some of the things they can mean, for instance: Integrity, the courage to be whole, to try to mold an entire person in this particular context, living in relation to one another in the full poetry of existence. If the only tool we have ultimately to use is our lives, so we use it in the way we can by choosing a way to live that will demonstrate the way we feel and the way we know. Integrity—a man like Paul Santmire. Trust. This is one word that when I asked the class at our rehearsal what it was they wanted me to say for them, everyone came up to me and said "Talk about trust, talk about the lack of trust both for us and the way we feel about others. Talk about the trust bust." What can you say about it? What can you say about a feeling that permeates a generation and that perhaps is not even understood by those who are distrusted? All we can do is keep trying again and again and again. There's that wonderful line in "East Coker" by Eliot about there's only the trying, again and again and again; to win again what we've lost before. Even in 1969, the speech was a sensation. Women were rare as public speakers unless they were protesting, and student speakers even more rare. At a time when many students were activists against the Vietnam War or for women's or LGBT or civil rights, inviting a student speaker presented the college with a certain amount of risk. What can you learn from this famous speech? Give voice to others. It's one of the speaker's most powerful tools, and one that guarantees you are thinking about your audience. But few speakers take this strong opportunity to give voice to their listeners. "Talk about the trust bust" put that feeling in the words of her fellow students and through a microphone on a day when their thoughts might not have been represented at all. It strikes me that the lines that follow--"What can you say about it? What can you say about a feeling that permeates a generation and that perhaps is not even understood by those who are distrusted? All we can do is keep trying again and again and again." --could be said today by a younger generation. Use the rule of three: On a day when big thoughts are called for, limiting her core speech to three--integrity, trust, and respect--helped give this speech structure and focus. Your audience (and you) can most easily remember three things, another advantage and part of what makes this speech truly memorable. Don't be afraid to challenge authority: In this setting, using her remarks to challenge the remarks of a sitting senator would have been essentially unheard of, and considered an affront and a bold speaking move. It's here that she truly took charge of the event and helped her classmates to feel they had a real spokesperson on stage.